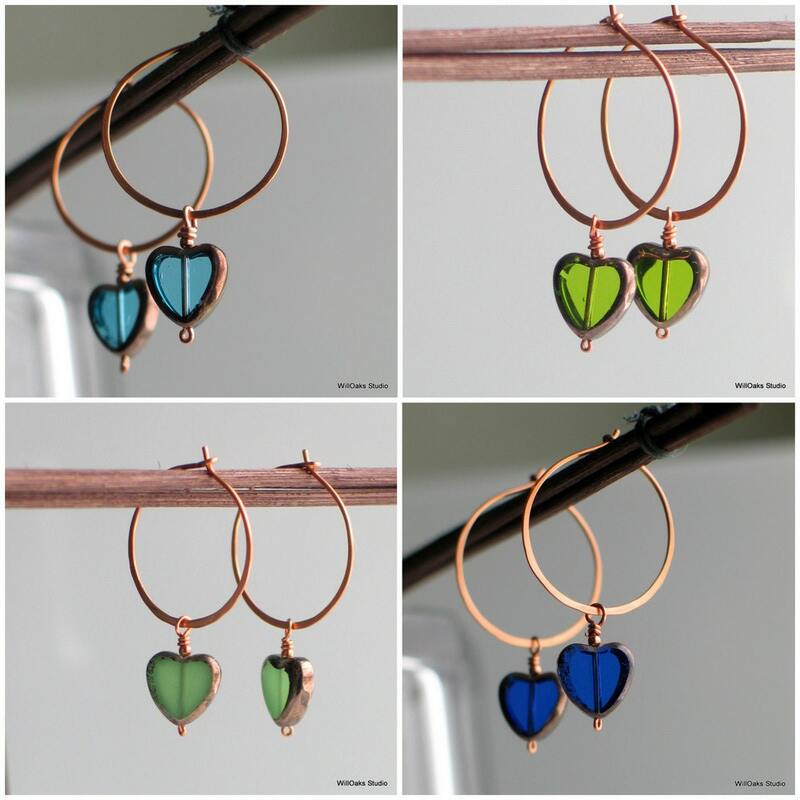 Easy way to grab several Valentine gifts for “all the ladies”-ready to give and specially made to show & share love: a collection of 4 pairs of hoop earrings with Czech glass heart dangles. 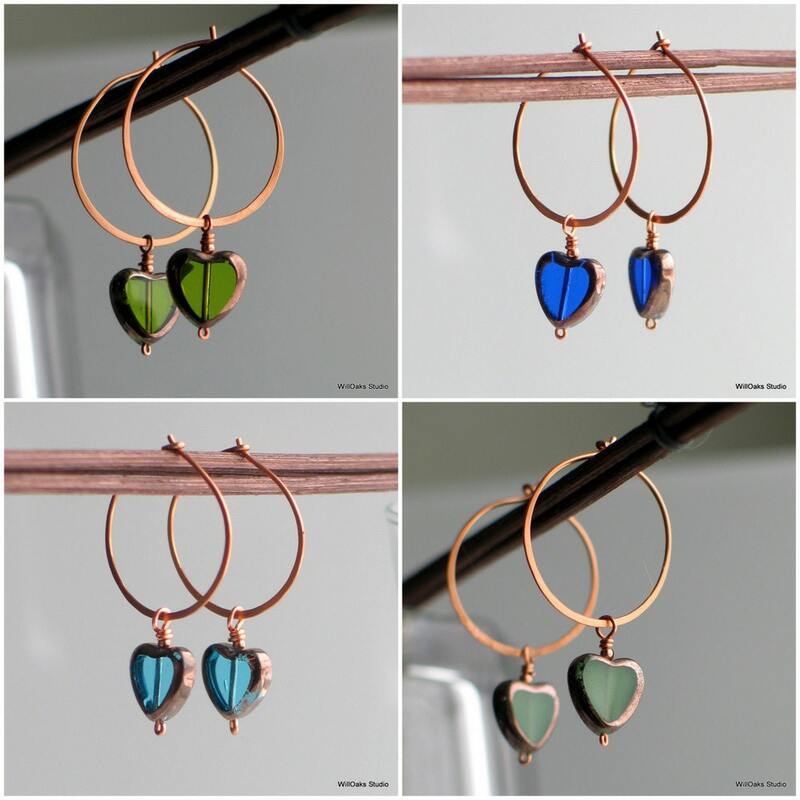 Handmade hoop earrings feature a special edition of Czech table cut, metallic washed heart shaped glass beads in 4 colors: a bright teal or turquoise blue, peridot green, celadon green and cobalt blue, at a special price when purchased as a set to give as gifts. 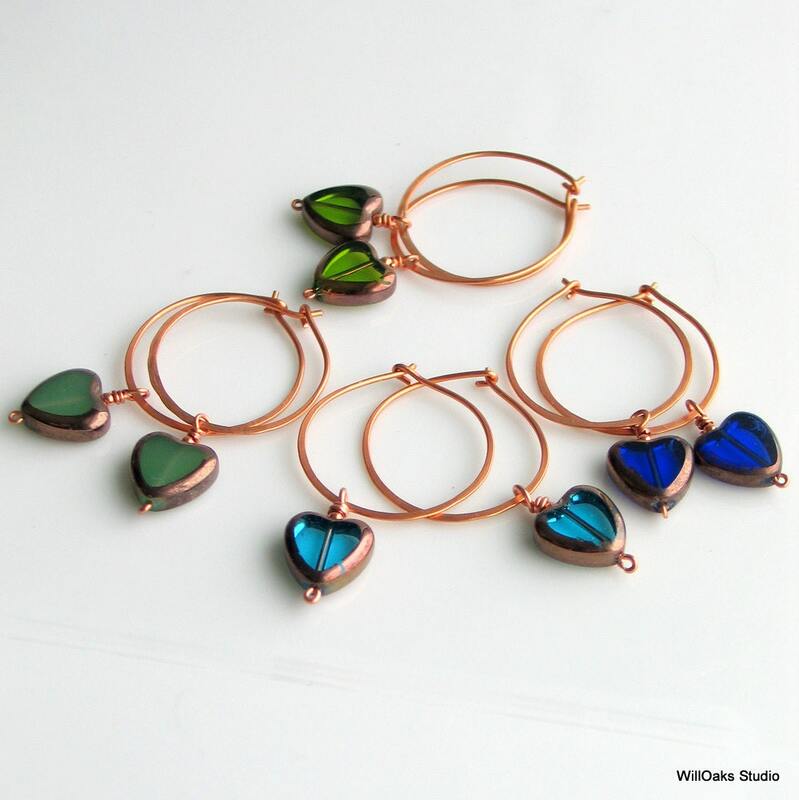 I make copper hoops, about 1" diameter, from coated pure copper wire that has been formed, hammered for shape, tumbled for strength and then are so easy to wear. Including the heart dangle, the total length is just about 1 3/4" measured from the top of the hoop. I just love the iconic heart shape, and I found this special edition of Czech glass about 6 or 7 years ago and have never found them again so perhaps it was an experiment? I'm not sure about the history but I do know that these charming little glass hearts are each about approximately 1/2" tall and wide, and about 1/8" thick. The outer edges feature a rustic copper colored metallic coating, which serves as a sweet "frame" for the transparent bright colors in the interior of the glass heart. A limited edition, available in 4 different colors either here as a set, or individually in other listings in my studio. Perfect for all heart lovers....who DON'T want pink or red....as shades of blues and greens are the palette here! 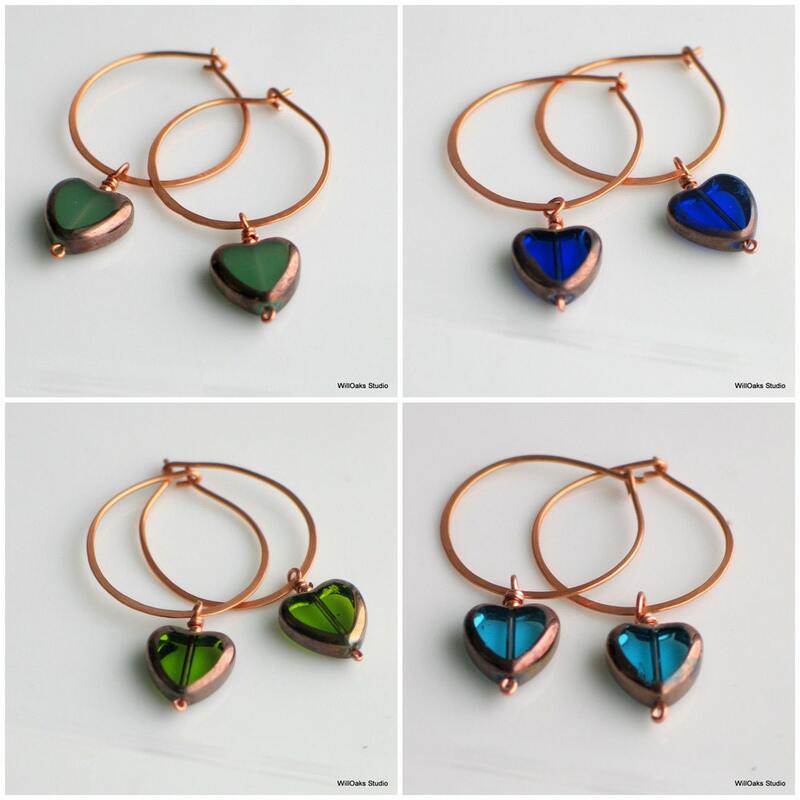 This listing is for four (4) pairs of heart hoop earrings. Packed into four small signature gift boxes, all ready to give! 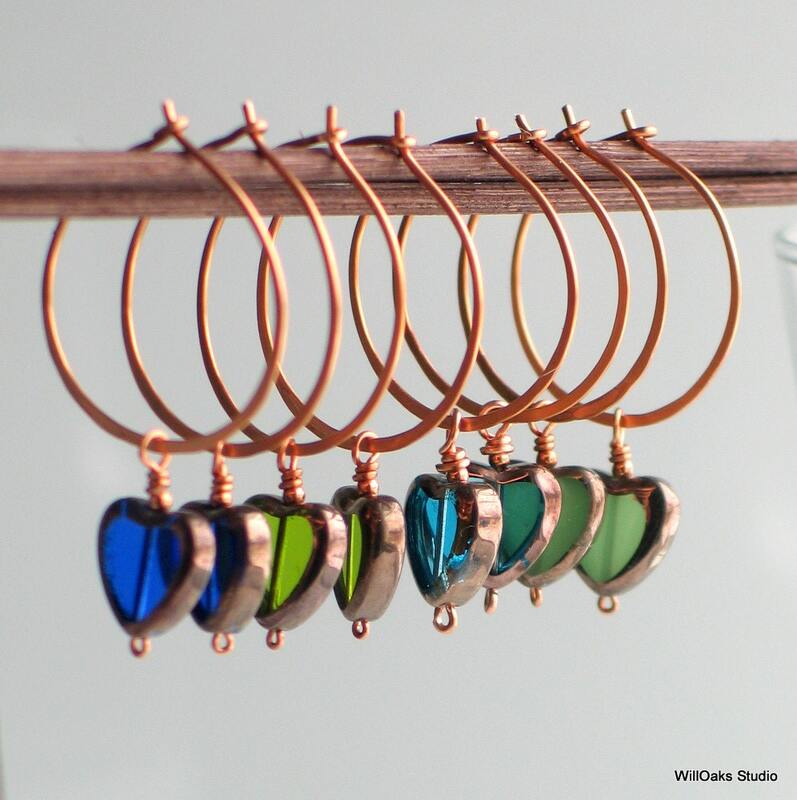 Priced just right so you can have original heart earrings--and can gift a few pairs too!